During last three-year of exploring New Brunswick, I have stumbled upon locations of known Loyalist assembly. I initially noticed graveyards had bold signage, identifying United Empire Loyalist burial grounds. I didn’t quiet get the importance of it. The Loyalists, sounds like a long historical story that I am not getting into, except for this sound bite-After the American Revolution, more than 100,000 former residence of the 13 colonies, that remained loyal to Britain, where virtually homeless. Their property and possessions confiscated, they were bullied and persecuted by former friends and neighbors that sided wi,th the Rebels. With the promise of land grants and safe passage, they took what they could carry, boarded on British ships and headed for safety within the British Territories. Nova Scotia at the time, included all the land that is presently New Brunswick, received an influx of these eclectic refugees. It wasn’t until this summer, when I went to Hampton, to write about the anniversary of the bill of Human Rights. please read; Humanity Found in Hampton, NB , That I was handed a brochure called The Loyalist Route. A map identifying places of significant Loyalist influence and culture, along the Lower Saint John River Passage. Plaque states; Late 1777 Majour Gilfred Studholm hurriedly fortified this ridge over looking the mouth of the Saint John River. Throughout the remainder of the American Revolutionary war, the presence of Fort Howe, its guns and garrison guarded the settlement at the river mouth from Attack by American Privateers. 2. Loyalist House, 120 Union Street, Saint John. This house built by Loyalist David Daniel Merritt is one of the oldest building in Saint John. The Merritt family resided in it for more than 150 years. It luckily survived several devastating fires that destroyed much of old saint John. Loyalist house Saint John NB. The foundation is built right into the rock. Saint John’s original burial ground was established on this site shortly after the landing of the United Empire Loyalists in 1783. After its closure as a cemetery in 1848, the site became a memorial garden with tree-lined walkways and flower beds…. The parish church established by the Loyalists when they arrived. 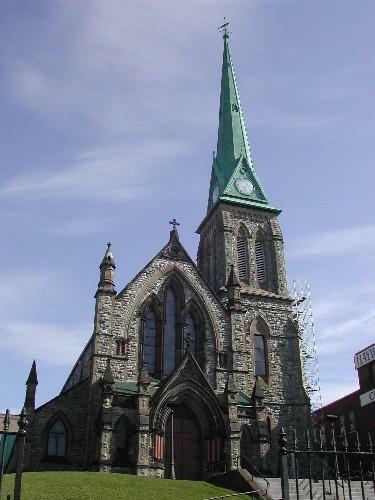 The great Saint John fire of 1877, destroyed the original Trinity Church, and most of the city. Housed inside is the original coat of arms. Edward Winslow removed it from Boston to prevent it from falling into Rebel hands. 6. St Paul’s Anglican Church and Graveyard. 486 route Kennebecasis river Road, Hampton. The land this church sits on was donated by two Loyalist families, the DeMilles and the Crawfords. 8. Harding Point at Westfield Grand Bay Ferry landing. There is a building at Hardening Point that is significant, located inside the campground. However, when you turn the corner towards it, you land directly in the line up for the ferry crossing the Saint John River. The ferry has been loading each time I am here, so I chose to board rather than wait for the next one. I did stop at the cemetery, so I wouldn’t come away with just a road sign. 10. Major John Coffin Grave. St Peter’s Cemetery Route 102 Woodsmans Point It was hidden behind the tree trunk his son is resting beside him. There is a Royal Canadian Legion cross on the grave. 11. St Paul’s Anglican Church, Oak Point Branch Road, Oak Point. This church is surrounded by a grave yard. The ones on the left are very old and I couldn’t read the inscription. The plaque on the door is a commemoration from 1967, stating the church haves been a house of worship in the community for over a hundred plus years. 12. St Stephen’s Anglican Church Route 102 Queenston, New Brunswick. Colonel Richard Hewitt and his family are buried here. He loved this area so much he was the spearhead for the formation of this church, his house was beside it. 13 Elm Hill. Elm Hill Road North of Pleasant Villa, Route 102. Many of the free black Loyalist arrived in New Brunswick and settled in Elm Hill. Descendant of the original black Loyalists still reside here today. Community of Elm Hill was settled by Black Loyalist. many Of the Black Loyalist descendants, call the community of Elm Hill home. 15 Jemseg Ferry ferry road, The ferry was taken out of service several years ago and I have gone to both sides of the river in search of some sort of plaque or landmark. I have found neither. But it is an excellent place to see Osprey, Ducks, and various birds and turtles. 16 Fanjoys Point Cemetery, Route 105, I came across a Waterborough Baptist Cemetery. I did find some FanJoy sir name on head stones. Then I found Fanjoy Point Road and followed it to a lovely piece of land with a beacon light and herring cloud patterned sky. I did not located a cemetery but it was picturesque. 18 Fort Hughes Hazen Park Oromocto. This replicate of the original blockhouse that was here shows two soldiers, the one on the left was a Royal Fencible American soldier in garrison during the American Revolutionary War. The other a French forces soldier. Please follow my story titled 10 Things You Didn’t Know; Oromocto, NB. to know more. 19 Loyalist Encampment and Cemetery, Morrell Park Fredericton. The Loyalist that came up river to claim their land grant close to Fredericton, were still in tents when the early winter settled in. Many suffered greatly some died of hunger and cold. Follow the Salamanca trail for a short walk to find the St Anne Point Loyalist cemetery. For further reading on #19 #20, 21, and 22 and other Loyalist home around Fredericton, please see my story. My Fredericton, New Brunswick. This was the home of Hon. Jonathan Odell, the first Provincial Secretary and an accomplished minister, doctor and writer. This home is a designated Fredericton Heritage trust home, build around 1785. 21 Old Burial Ground Fredericton. Many of the prominent Loyalist citizens are buried here; Captain Saunders and Lieutenant Samuel Denny Street to name two. 24 Village of Kings Landing Historical Settlement, not an actual town but a replica of the daily life from the Loyalist times up to 1910. I had a lovely horse and buggy ride and got to gossip with the ” locals,” actors portraying real people who lived in the time period. Eight original Loyalist homes were moved here and restored. Historic buildings that would have been underwater with the damning of the saint John River. With my Loyalist Route complete. I hope you enjoyed it. I wish you happy travels and Happy Holidays from Maritime Mac. another very informative article, thanks Kelly! A fascinating historical trail. Thanks for the tour. That does sound like a fascinating idea for a novel – The Loyalists. That’s the peculiar part. My family was on the other side. Honestly, I have not given much thought to the fact that the Loyalists would have considered themselves as being patriotic. Lovely photos and information. I hope you write this idea of yours into at least a short story. If you don’t, well ummm. lol I won’t steal the idea. I promise!! Thanks for visiting. I appreciated the feedback. wow wounder if there is a list of them all that arrived. They were granted land everywhere from Nova Scotia to Ontario. Don’t really know…it was one of those family stories none of us–apparently–investigated. My brother was able to do some research about the Caswell origins along the English/Welsh border, many years ago. I was aware of that. One time when we we driving through Cambridge, Mass., Dad pointed out the black band around a house’s chimney. He said it was the sign of a Loyalist household. Is this true? Gee I don’t know. I have a lot of photos of loyalist homes in Fredericton, I will have a look at them, but I am sure they were treated differently there, than here. Maybe like a scarelet letter type deal.to identify them. We welcomed them, they basically doubled the population in some areas. They were the driving force behind creating New Brunswick They set up the University of New Brunswick. brought a lot of architectural ideas and helped build our province. Indeed they were good, hard-working people—of a certain political view. And a great boon to New Brunswick! I do like a good trail, and this one sounds really interesting! It was interesting. I enjoyed tracing their steps and finding new communities. I tried mentally trying to see myself walking 50 km through the woods, to my land claim. such struggles and hardship. I guess they were happy to be safe. Always enjoy reading your work. Wonderful photos and topics. thank you, I have an entertaining one tomorrow coming. Oh thank you. yes, when you do a big trip like that you want to linger is a spot or two to get the best of it. let me know what kinds of things you enjoy. I can definitely, point you in the correct direction. Thanks so much Kelly! I will hit ya up around Spring! In doing family history lately we found out that some of our ancestors were Loyalists so this is quite an interesting post for me. I don’t remember too much of the story but I do know that some (or all) of them did come back to the US and settled in Maine. Must visit this area one of these days. Thank you for this great post. Oh very cool. I will check out the links. glad you enjoyed my story. I find this topic fascinating.